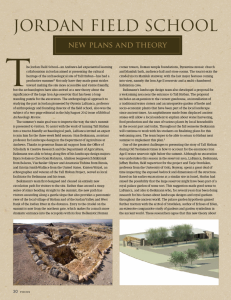 The inaugural season of Phase III of the Hisban excavations focused upon mapping and documenting the ruins, site preservation and presentation, as well as limited excavations supporting those objectives. Clearance of accumulated debris from the Iron Age reservoir netted several finds, including an Iron Age seal. The hydrology of the site, including the proposal that this reservoir served as part of a royal estate continues to be considered. Excavation of square B8 revealed walls and pits, as well as a reused Byzantine incense stand. Work along the north east corner of the citadel and along the south west slope of the site uncovered Mamluk era vaulted chambers and domestic structures. An amphitheater-shaped welcome area inside the entrance was prepared by the JFS landscape team utilizing ancient building materials from the site and cooperative rehabilitation plans for the nearby Nabulsi qasr were discussed with the landowners, Municipality and other local institutions. Excavations in 2014 continued to uncover a Mamluk and Ottoman farmhouse on the southwest slope and Mamluk vaulted structures outside the northwest cornor of the citadel. Excavations above the Iron Age reservoir expanded into two squares and uncovered two pristine Mamluk apothecary jars, while clearance work below, in the reservoir itself continued. Finds included a stone Eye of Horus amulet. A team studied and mapped Hisban’s labyrinth of subterranean features and the hydrology of the site. The JFS landscape team continued site presentation and development work, including more pathways and viewing platforms, as well as fencing to protect visitors. For the 2015 season, the JFS excavation team worked at the neighboring site of Tall Jalul, while the site presentation team continued work on and around Hisban, including a preliminary study of roof-top agriculture. The 2016 excavations focused upon the western, northern and southern slopes of the site and focused upon questions relating to the history of the medieval Islamic settlement and addressing selected stratigraphic problems. A portion of the Iron Age reservoir was cleared to its floor and portions of Byzantine, Abbasid, Mamluk and Ottoman period domestic structures, and a Mamluk barrel-vaulted chamber were uncovered. Notable finds included a complete glazed lamp and fragments of lustered and enameled glass vessels from the fourteenth century. A hinterland cave survey also began. The JFS site preservation and presentation team refreshed the interpretive paths and signs as well as refurbished the welcome garden as a space for community celebrations. Local residents hosted two events during the season at the welcome garden. Two JFS students extended their stay in Jordan teaching English to local children. Plans for a new welcome center, entrance road and signage were also discussed with the municipality.